i love pasta salad. i could eat pasta salad (or really, pasta in any form) every day of the week. i especially enjoy it in the warmer days of summer, as it doesn’t involve much time in front of a hot stove + can be just as tasty chilled (if not tastier) as it is warmed. i came across a recipe for charred corn + jalapeno pasta salad with cilantro oil on bran appetit, + while it looked delicious, i thought that some additional ingredients could make it even tastier. after thinking about the perfect flavor/texture combinations, i added black beans, fresh tomatoes, lime juice + cotija cheese to the original recipe. the results? absolutely perfect! the cilantro infuses the olive oil with a lovely flavor + color, similar in taste to a traditional pesto, but with a slightly cilantro-y kick. the most surprising thing? my cilantro-loathing husband ate this. due to all of the complex flavors, the cilantro does not dominate this dish (as it sometimes can). instead, it lends a mild, delicious flavor to a wonderfully summery pasta salad. while this is great whether you serve it chilled, room temperature, or warm, i found that serving it slightly warm best showcased the amazing flavors. this is definitely going to be in heavy rotation throughout the rest of the summer + fall – it’s the perfect warm weather side! in a small bowl, stir the minced cilantro into the 1/2 cup olive oil + let this sit until ready to serve. bring large pot of salted water to a boil. cook pasta until al dente. reserve 1/2 cup of the cooking liquid, + drain. set aside. heat 1 tablespoon olive oil in a skillet over medium-high heat. add diced jalapenos + cook 3-4 minutes until softened. toss the corn kernels into the pan with the peppers + cook, stirring occasionally, until the corn starts to brown. add the black beans + heat a few minutes longer, until heated through. 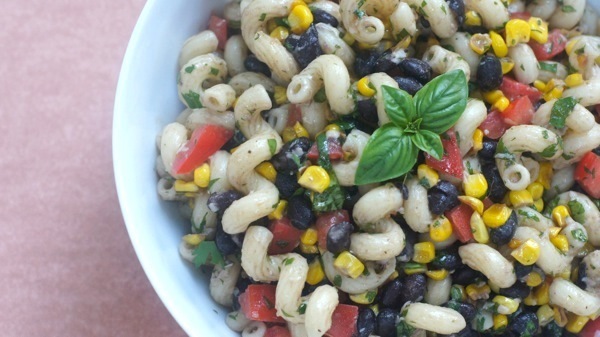 in a large bowl, toss the pasta, corn, jalapenos, black beans + cilantro oil together. add in the diced tomatoes, lime juice, + cotija cheese. salt + pepper to taste. serve warm, chilled, or at room temperature, depending on your preference. it is delicious + yes, super refreshing! between the veggies, herbs, lime + cotija cheese, the flavors are so bright + fresh. it would be perfect with grilled steaks (that’s what we ate it with) or burgers. definitely good cookout food! This looks delicious! I’ve been craving pasta salad for a cool lunch during this heat wave. I may have to whip up a batch next week. i’m always happy to find new blogs through friends. since i’m also a newlywed food blogger in tennessee, i was especially glad to find yours! =) let me know what you think of the pasta salad if you make it – we thought it was just delicious! Oh yum! Minus the jalapenos, that is. I’m a big-time pepper-wimp. totally acceptable! you could substitute green poblanos if you like the flavor of peppers but not the heat. also, since you love cilantro, i bet you’d enjoy the cilantro-infused oil just tossed with hot pasta – it’s similar to basil pesto, but with a little cilantro kick. delicious! Ooooh…this looks fantastic! I’m nuts about pasta salads too, and I’m sure I would love this! I’d probably reduce the amount of cilantro because as much as I love it, more than just a little bit of it gives me really bad heartburn. I’ve never heard of cotija cheese before, but I reckon I could use whatever I have in my fridge. isn’t pasta salad great?! cotija cheese is a mexican cow’s milk cheese that is used in lots of southwestern / mexican dishes. it has a wonderfully tangy, slightly salty kick. you could definitely substitute a different type of cheese – parmesan would work great! thank you! i use cavatappi in tons of recipes – it has a slightly more dressed-up look than the regular ol’ bowties or elbows, i think. you’re going to love this pasta salad – let me know how it turns out for you + how you adapt it, if at all! This is a winning pasta dish. Pretty, colorful, healthy and don’t have to turn on the oven! That cilantro oil sounds heavenly !! This looks so good! I’m so excited I discovered your blog! glad you found it, too! =) going to check out your blog now, also — i love meeting new bloggers!